Esther Duquette and Gilles Poulin-Denis will perform in a remount of the critically-acclaimed Straight Jacket Winter as part of this year's Magnetic North Festival. Following a two-year hiatus and the retirement of $234,000 in operating debt, the Magnetic North Theatre Festival announced a line-up which will be heavy on local talent. “The festival has had an incredible amount of fundraising support from our national arts community and long-time MagNorth supporters, with our Vancouver community especially keen to be featured in this year’s festival,” says Magnetic North board chair and Cultch executive director Heather Redfern in a media release. The nine-day festival in June will feature over a dozen performances, heavy on local talent including Tara Cheyenne Performance, rice & beans theatre, Alley Theatre, Touchstone Theatre, Theatre Conspiracy, and others. Those homes are spread across the Lower Mainland thanks to partnerships with the Shadbolt Centre, Presentation House Theatre, Progress Lab 1422, Touchstone Theatre, The Post at 750, and The Cultch. 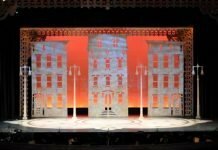 While the word “theatre” has ultimately remained in the festival title, there remains a new emphasis on the broader live performing arts which now includes dance. Another aspect to the new Magnetic North will be conversations about the future of the festival, facilitated by Rumble Theatre’s Artistic Director, Jivesh Parasram. Festival passes, including access to all workshops, symposiums, and select shows, will be available at either $160 or $60, with participants picking the fee they want to pay. A list of performances for the 2019 Magnetic North Theatre Festival follows. The festival’s full programming and schedule will be released on April 30. Visit magneticnorthfestival.ca for more information.